I thought this kind of toilet could be found in Japan only. 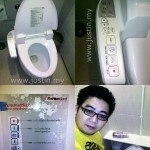 But yesterday I found the most advanced toilet seater in the public toilet of Fashion Island, Minburi, Bangkok, Thailand. I’ve been spending 20 minutes inside, and this is the first time to use this kind of toilet seater in my life.